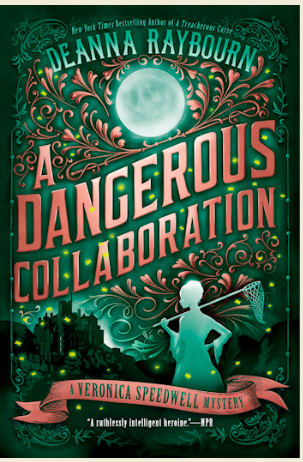 Hello, book lovers, I welcome everyone to my brand new blog today about "A Dangerous Collaboration" by Deanna Raybourn. First a very huge thank you to Berkley Publication for granting me an E-Arc on Netgalley for this amazing fourth book. This book is the fourth in the Wonderful Veronica Speedwell Series and I seriously suggest you go pick up the first three books right now. A Dangerous Collaboration is set to release on March 12th and I am so excited for it even though I've read the ARC. The Veronica Speedwell series is amazing and I have reread the first two books so far and I really can’t wait to read all four books back to back. So now onto all of the really good information about this amazing new book, which you need to buy or borrow the series from the library. The First thing I am dying to discuss is the great Veronica Speedwell. Veronica really seems to have grown in this book. 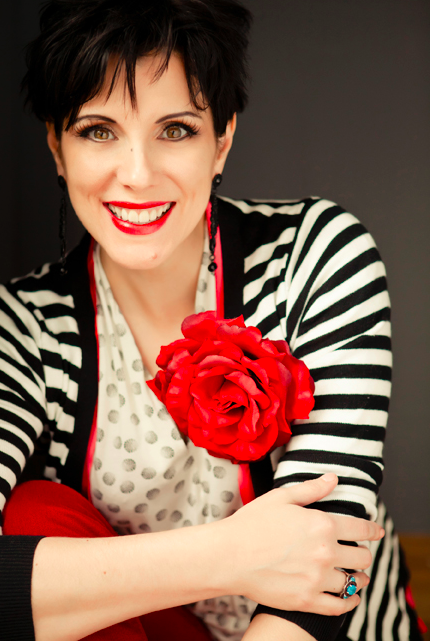 She comes across as more focus on her work and pursuing it than she has been in other books. She becomes wiser about her life and her family connections more than we have seen of her. Deanna really writes Veronica as a human female who has an independent voice in any situation, and I love that. I also love how Veronica is a very clear cut with her thought process, along with how she can justify all of her thoughts about things. She sees the everyday faults that humans basically do, better than most people would see them. Veronica really is a detective with other people actions. But the thing Veronica does as a character to me is that she has a very hard time seeing her own actions as clearly as everyone else. This character comes off as so Human, that it's hard for me to remember she is just one of my favorite characters. Now on to Revelstoke Templeton Vane aka Stroker. I have always loved Stroker but this fourth book really shows him as the human that only Veronica has seen. I love how Deanna shows us the deep thought process exploration that Stroker has toward his family in this book. He really learns that maybe he not that different from his family like he wants to believe. Stroker also learns more about Tiberius as the person he is now instead of what old memories that Stoker has of him. I just love Stoker growth as a person. I feel like he gains more information that set his own freedom off as a character and especially as a man. This book really shows Stoker soul healing more and more than we’ve seen before with this character. Finally, we get to the great mischief Viscountess Tiberius Templeton Vane and I can so hear him in my mind with smugness as I write this review of him. He seems to want Veronica attention but comes to Understand it will never be as he wants it. As he continues in the story though, he holds out hope and shares more of himself with Veronica. He really gives himself over to us readers with a deeper history of his past involving Malcolm. Even stoker doesn’t know about this history until they get to this adventure. I always love the moments that Deanna give us with all of the Templeton Vane Men but I am so bloody happy by how much of Tiberius is in this book. Deanna really gives us a deeply thoughtful look at the Templeton-Vane brothers and how memories of their history have distorted their minds. I rated this book a five out of five stars because it did not lack for anything. Deanna gave us a great mystery that leads to exploring all of her characters so well especially the main characters above. The Veronica Speedwell series has always had this deep sense of exploring family vs Friends. This idea tends to affect Veronica and Stroker and how they develop more like people in the books. I am so excited to say this book was no different and it very much gave us that idea of Family exploration. I want ten more Veronica speedwell mystery books because I can never have enough of Deanna writing. Deanna as an author is one of my personal faves because her writing is so lyrical. She really develops a character in such a poetic thoughtful human way with human feelings. All of those Human feelings really make you feel like these characters are alive and are your friends. I will always want more of Deanna’s writing because it just gets better with time. I sincerely hope you enjoyed this blog, and it makes you pick up the entire Veronica Speedwell series. All the links for all of my Veronica reviews are listed below along with the links for the books, plus Deanna information. Also, all of my links are listed below and I would appreciate the support so much if you love my blogs. Fountain Bookstore link gets you Signed Copies by Deanna plus other things so I would pursue that if you can. 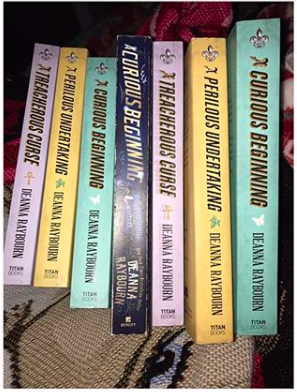 New York Times and USA Today bestselling novelist Deanna Raybourn is a 6th-generation native Texan. She graduated with a double major in English and history from the University of Texas at San Antonio. Married to her college sweetheart and the mother of one, Raybourn makes her home in Virginia. Her novels have been nominated for numerous awards including five RITAs, two RT Reviewers' Choice awards, the Agatha, two Dilys Winns, a Last Laugh, and three du Mauriers. Her Lady Julia Grey novels are currently in development as a television series in the UK and she launched a new Victorian mystery series with the 2015 release of A CURIOUS BEGINNING, featuring intrepid butterfly-hunter and amateur sleuth, Veronica Speedwell. Veronica's most recent adventure is A PERILOUS UNDERTAKING (January 2017), and book three, A TREACHEROUS CURSE, was published in January 2018. Further books in the Veronica Speedwell series are contracted through 2020.